The only way to get a true representation of the difference between a digitally captured image, and a film captured image is take the photos of the same subject at virtually the same time, with the same lens and camera settings. However, you can still see some distinct differences between the two media with these two photos of Double Delight. 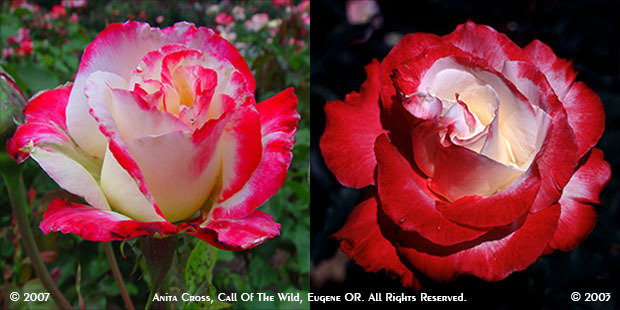 The film version is softer, the contrast between the rose and the background more pronounced, and the background much darker. To get the foreground in focus, and the background blurry, I set my f-stop to a low number, usually 5.6, which opens up the aperture allowing more light to enter at a faster shutter speed. Because the image sensor of the digital camera is more sensitive to light than film, the background stays light, even when blurry. It took a lot of trial and error, but I found I got better results with the digital camera when I would step back further and use the zoom to bring the shot in close to the flower. This got me the level of blur I had come to rely on with film. But it still didn’t allow for those dramatic lighting differences as you see in the film images above. Film is not superior to digital, or vice versa. They are two very different mediums for the artist to use. Digital is much more convenient and economical, and it is perfect for the average person who just wants to take photos of their family, friends and memories on vacation. The ability to pick up more of the background is even a plus in those situations. Film photography will not die out completely, however, as purists will keep it alive.